Soutono’s SX3 is a solar enabled backpacking tent that allows campers to have sustainable power virtually anywhere. Electronic devices are at the heart of even the most remote outdoor experiences. Soutono sought to create a sustainable energy solution based on the core needs of campers. Unlike other solutions that encumber the camping experience by adding complexity and weight; SX3 provides an all-in-one solution, while still allowing for the versatility that campers demand. UNTETHERED: Campers can harness power in any environment with sunlight. ROBUST: The amorphous solar panel is nearly indestructible. ULTRALIGHT: The system weighs just 2.5lbs and adds no appreciable volume to what is already required of a comparable tent. VERSATILE: The modular design allows the solar panel and charging system to be removed and attached to other surfaces like backpacks, trees, vehicles and more. SX3 uses amorphous solar technology, this allows the panel to be rolled for easy packing. The technology is extremely lightweight and more robust compared to crystalline panel technology. SX3’s charging system was designed to accommodate a variety of use cases. 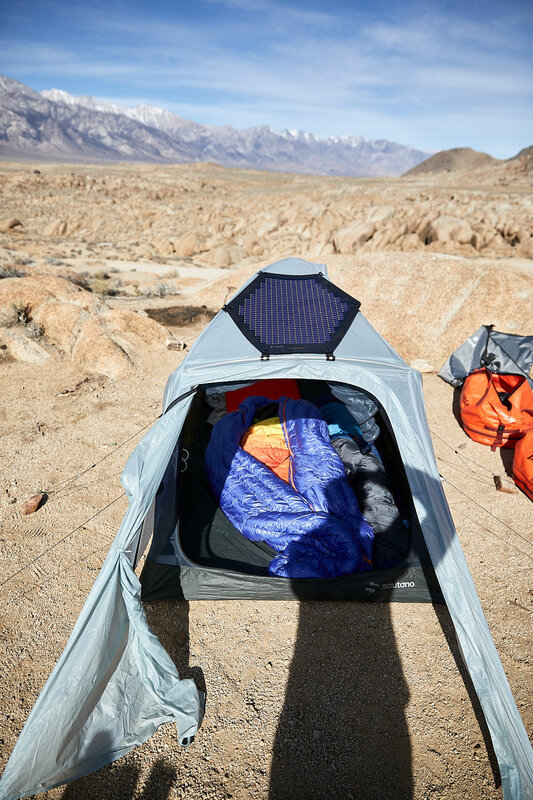 The solar panel and USB hub can be affixed to the tent, stationed at a campsite or even attached to a backpack to allow for charging on the move. SX3’s shelter stands alone as an uncompromised 3 season, 2 person backpacking tent. The pre-bent pole design allows for added vertical clearance and volume, while the ultra-lightweight mesh provides protection from the smallest of insects.